A spiral ham is a simple centerpiece for a meal that will feed a crowd. Cooking takes only a few steps, and because the ham is already sliced it can easily be carved and served at meal time. The key to a juicy ham is to be sure not to overcook it. You will need a deep roasting pan. If the ham is not already packaged with flavoring, you may want to soak it in water for half an hour to remove some of the ham's salt. You can then place the spiral ham in the roasting pan and start preheating your oven. Add about once inch of water to the bottom of your roasting pan. You need the oven to reach a temperature of 325 F. While you are waiting for the oven to preheat, you can add your spices. 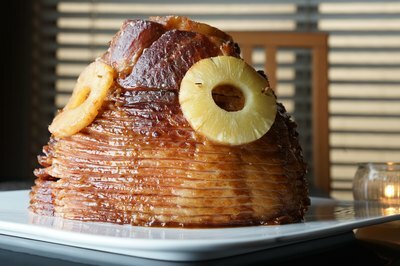 Honey, brown sugar and pineapples are all great toppings for a spiral sliced ham. Some individuals prefer to slather their hams with jellies or jams. This is fine, too. The important thing to remember is to leave the ham alone and not baste it at all. This could make the ham too salty. Warning: Never use salt. The ham is already salty. If you add extra salt, no one will be able to eat it. Place the lid on your roasting pan if you can or cover the ham with aluminum foil and slide your spiral ham in to the oven. 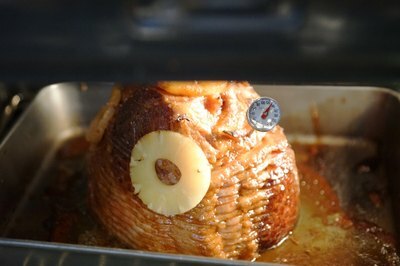 Continue cooking the ham at 325 F. for 12 minutes per pound. The ham is already cooked so it will be safe to eat at any temperature. You do, however, want to use a meat thermometer to make sure the inside of the ham has reached a temperature of 130 F. so that it will be hot enough for all of your guests to enjoy. If you want to glaze your ham, you can do this just before the last two pounds need to cook. For example, if your ham is 10 pounds, you will want to take it out and add the glaze after eight pounds of cooking time. That's eight pounds times 12 minutes for a total of 96 minutes. Then place the ham back in the oven for the remaining 24 minutes. 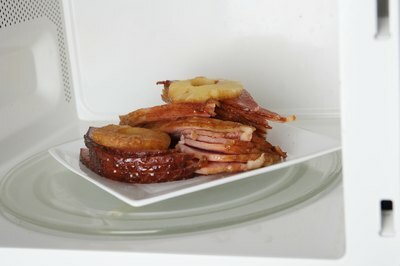 If you just need enough ham for a single dinner, you may just want to cook the ham in the microwave. It will save you preparation and cooking time. Cut the amount of ham you need off of the spiral ham and place it in a microwave safe cooking dish. Set it in the microwave and cook on high for ten minutes per pound. If you have half a pound, you would only need to cook it for five minutes. Again, you can use the meat thermometer to make sure the temperature of the ham has reached 130 F. Be careful when removing the plate from the microwave because it will be extremely hot.